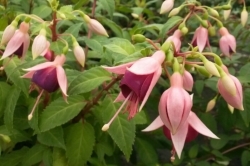 Below are a few sites that fuchsia lovers may also find of interest. Our local event - a great day out for all the family. Spring and Autumn shows brimming with colour and temptation! Show held at Sandringham in Norfolk where we exhibit our fuchsias. Something for every gardener in the shadow of the majestic Malvern Hills. Catch up with all your favourite gardeners at this fantastic live event at the NEC. A summer event in the grounds of the amazing Blenheim Palace. Just up the road, a great day out for everyone. If you haven't found it on our website then try here. Fuchsia photos for fuchsia lovers. Body representing professional horticultural trade exhibitors.